Are you looking to take your garden to the next level? Incorporating fruit trees in to your outside place is easier than you may think, and will make your garden look great. What’s more, you can enjoy the yield of delicious home-grown fresh fruit and berries from your plants, with the satisfaction of knowing you have grown them yourself. There are plenty of options to choose from when considering what trees or bushes you should grow. Whether you are a complete novice or have some experience, you will be able to find the perfect fruit trees for your garden. Figs are a wonderful fruit that are sometimes overlooked. These plump and tasty fruits are great in salads as well as desserts, and are very easy to grow yourself. There are a few types of fig trees, the most common of which is the Brown Turkey. This plant is extremely hardy, and can withstand temperatures down past 32 degrees Fahrenheit, which makes it a great candidate for those living in colder climates. It can also thrive during long periods without water, although it prefers not to! The fig tree is also very attractive to look at. Its large, wide fingered ornamental leaves speak of tropical destinations, and its round velvety fruit begs to be picked and devoured. Fig trees do prefer a sunny spot in your garden, and will do best when its roots are restricted. You can accomplish this either by potting in a large container, or in the soil with gravel layers to constrict the roots. Depending on the type of fig tree you choose, you can harvest its fruits up to four times a year. These lush juicy berries are not just a tasty treat. Raspberries contain many minerals and vitamins, making them a great choice to grow yourself. With vitamins A and E, and plenty of antioxidants, raspberries are also high in fiber. Use as an ingredient in an abundant variety of desserts such as pavlova, or for homemade jams. These berries freeze well and serve as a wonderful treat for summer occasions. Plant your raspberry cane from November to March, choosing somewhere that is well sheltered from the wind, yet with a good amount of sunlight if possible. The berries will be ready for harvesting starting in early summer and will provide plenty of yields through to the middle of autumn. Ensure that your plant has decent stability by providing a trellis system. Once the raspberry plant is well-established, you will reap the rewards of this sweet and tangy fruit for years to come. One of the most popular fruit trees to grow, apples are hugely versatile, you can make a range of products including apple pie, cider, apple sauce and juice. These crisp and flavorsome fruits are also enjoyable straight from your tree, and can grow in great abundance. Apple trees come in many varieties, from the tangy Braeburn to the sweet Golden Delicious, the juicy Pink Lady to the sour Granny Smith. Something all these fruit trees have in common is their durability and ease to maintain, making them a perfect choice for your garden. Buying a sapling will take away some of the waiting time, so you can enjoy fresh and delicious fruit almost straight away. 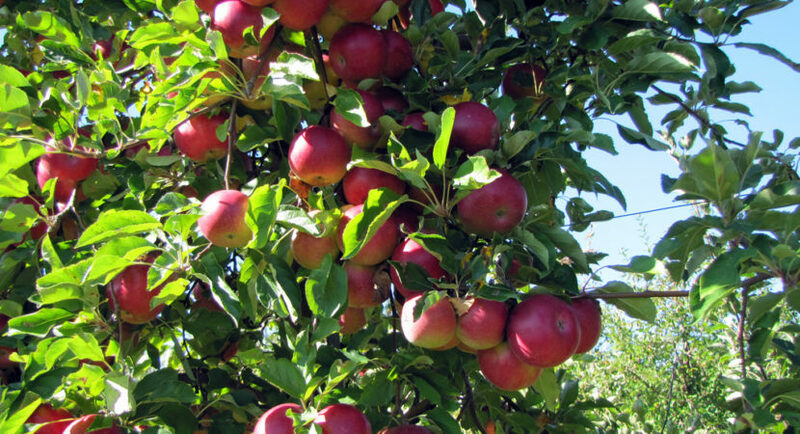 Your apples should be ready to pick every fall, from the end of September to mid-October. Perfect for enjoying a freshly baked apple pie when the weather starts to get colder! Apple trees are a great option for your first fruit tree, and are a sound investment. They can endure cold weather and need very little looking after, and will provide you with a bountiful yield of apples every year. Cherry trees are a popular choice for a home garden. Not only do these trees provide a wonderfully sweet and juicy berry, they also look stunningly beautiful when blossoming in spring. These plum, aromatic fruits can be enjoyed straight from the tree, or used in preserves and desserts. There are many cherry tree varieties, and you can choose one according to your preference of sweetness and tanginess. Make sure the option you choose is a self-pollinating breed, meaning that it does not need another tree to pollinate and bear fruit. There are plenty of both sweet and sour trees which will self-pollinate, so you don’t need to plant multiple trees to gain its benefits. These trees enjoy the sunshine when they can get it, so plant them where they will be best served from optimal sunlight. However, it is yet another durable plant, that can survive even the harshest of frosts, making it a great all-rounder and a good starter fruit tree. The cherry tree will begin to bloom during March, it’s trademark cherry blossoms brightening your garden after winter, and signaling the start of spring! Make sure to keep it well watered if you live in drier climates. Around July each year, your tree will bear fruits that are ripe and ready for picking, providing a full harvest of homegrown juicy cherries! Plums are delicious whether you eat the freshly picked from the tree, or prepare them in a multitude of ways. These fruits make lovely jams and preserves and are also delightful stewed in brandy and served with ice cream or custard for a traditional style dessert. Plum trees are easy to grow, with fruits ready to harvest in early July. Thriving best in full sunlight, give your sapling a prime location in your garden to reap the full rewards. If possible, find a sheltered position to avoid winds. The damson plum tree is the hardiest, and can endure cold winters with the right care, making it a perfect choice for European and North American climates. The beautiful indigo flesh of this fruit makes a stunning addition to any garden, ready to harvest in late summer to early autumn. With petite white blossoms in early spring, this a delightful tree all year round. Adam Clapton runs wisepick.org and writes about home improvement, electronics, appliances, and everything we need for even more comfortable life.